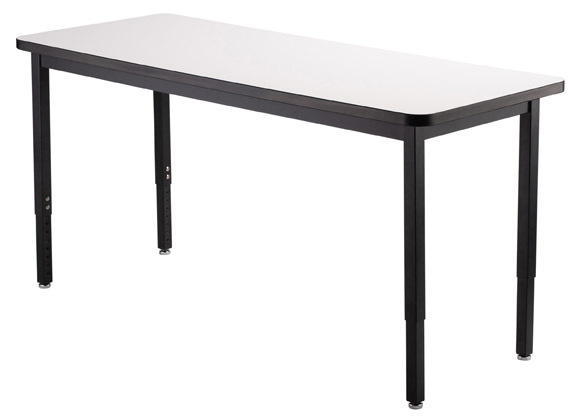 The NPS Utility Table with White Board Top provides for on-the-spot collaboration. From writing to brainstorming, students can easily jot down and share their ideas. The 1.25" thick High Pressure Laminate tabletop is easy to clean and will resist scratches. 16 gauge steel frame apron and 14 gauge legs make this table virtually indestructible. The legs adjust in 1” increments and are locked firmly in place with 2 K-9 external tooth lock washers and heavy duty tamper-free hex screws. All legs come standard with simple-adjust glides and have a caster option. NPS White Board Utility table…it’s write-on collaboration.